Enjoy all your local broadcasts from ABC, NBC, CBS, FOX, PBS, and other local networks with expanded programming for kids, news, sports, sitcoms and more with no cost or contracts. Just imagine never paying a monthly cable or satellite bill to enjoy your favorite shows! 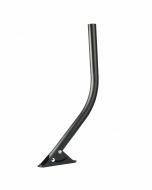 Are you troubled to adjust the antenna direction on the roof for better signal reception, especially on bad weather day? 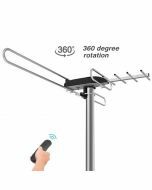 Now with this tv antenna, you will never have to do it again, just stay at home comfortably to adjust the antenna direction by the remote control. The distance from the broadcast towers will vary based on the location of your home. Visit http://dtv.gov/maps and enter your address or zip code for details about the towers near you. This information will assist in selecting the correct antenna model and aiming your antenna for the best results. We stand behind our products 100% with a 12-month warranty. Please note that over-the-air reception is dependent upon environmental factors and we cannot guarantee reception in all conditions. We do offer a 30-day money-back guarantee on all orders to allow you to test the antenna's suitability in your area. 1. 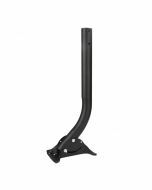 Mounting pole not included - Put B013057BDU into Amazon search box for 1byone pole. 2. The remote control of the antenna should face the direction of power supply unit without obstruction, rather than face the antenna main unit. 3. If you put this antenna on the roof or anywhere not in line of your sight, please note that there is no need to know which direction the unit is pointing. You can just stay in your room, adjust the direction by the remote control or power supply unit, and then scan for channels on your TV. 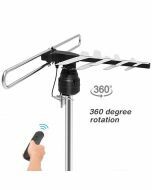 Once you find you can receive the most channels, the antenna is now pointing the optimal direction. Antenna Color code for my area is yellow. Would the 45 mile be most suitable? Yes, it would be suitable and thanks for your contact. will this work with a roku tv? It will pick up over the air stations in your area. It won't connect to internet stations or stream. Can I install this in my attic? Yes. it works with 4K TV.